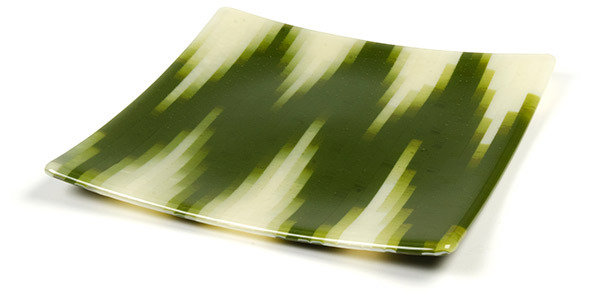 Making this chevron plate is a snap with Bullseye's Cascade sheet glass. 1. Start with a Cascade style sheet—we used a Special Production style here—cut into quarter inch strips. Keep your strips in order as you go. 2. Slide the strips up or down into the pattern you like. 3. Once you settle on a pattern, decide on your dimensions and mark a top and bottom line with a Sharpie. 4. Score along these lines. You can score the strips all at once, being careful to keep consistent pressure throughout your score. 5. Run your score lines. You can run multiple strips at once by sliding a section to the edge of the table and using the table to snap the score lines. 6. Cap with Clear to keep your lines tight. Glass/Tools: Cascade style sheet glass, 3 mm Clear sheet glass, glass cutter, Sharpie, and a straightedge. Tip: Make quick and efficient work of creating those strips with the G-Manu Glass Cutting system, an elegantly simple yet powerful tool developed by Rudi Gritsch. Watch a free video about the G-Manu.